Exceptional moments are made here. As southeast Minnesota's s largest and most experienced caterer, you can count on Rochester International Event Center to provide you with unmatched service, flawless attention to detail and exquisite food ensuring the most memorable wedding day for you and your guests. Our beautiful facility has plenty of free, front door parking and features a Grand Ballroom, which accommodates up 800 guests (13,000 sq feet) or can be divided in two, for separate events of up to 400 guests. We have a large, comfortable lobby area and a state of the art 6,000 square foot kitchen staffed by our full-time culinary team. Our food is guaranteed to be of the freshest and highest quality. Our award-winning culinary team creates exquisite food with a sophisticated presentation, sure to please the most discerning pallet. To ensure the freshest possible options, we nurture and cultivate our own seasonal garden on sight ensuring delicious, locally grown herbs and produce. For your wedding reception, we offer butler-passed appetizers, plated dinners, buffets, family style and a variety of creative and custom menu options. Your food will be expertly prepared and beautifully presented. 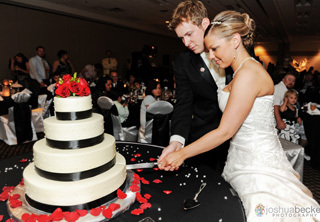 We offer a wide variety of different services to meet all of your needs including additional decorations and wedding cakes. We'd be happy to assist you with your wedding planning process and answer any questions you may have. We offer half the ballroom, which may accommodate up to 365 people, or the entire grand ballroom, which may accommodate up to 750 people. The Rochester Event Center does require food minimums on Saturdays along with a ballroom rental charge. We offer a special discount on Fridays and Sundays. Please feel free to ask an Event Center representative about our special non-peak rates for those interested in booking a wedding event during the week.